Park City has been home to golf courses for years, but now has some of the latest developments in the golfing world, with big name designers putting their signature styles in the Wasatch Mountains. Exclusive, gated community offering a top-notch championship golf course, spa, and clubhouse, surrounded by Utah's natural beauty. This country resort caters to weddings and other large celebrations, provides spa, dining and golf activities. Lavish country club featuring a Jack Nicholas inspired golf course, top-notch cuisine, fitness facility and more in Park City, UT. Featuring Olympic caliber facilities for winter sports, Soldier Hollow is a cross-country ski resort with beautiful lodging and scenery. Now combined with Park City Mountain, this ski area offers huge winter terrain, a variety of lodging options, and summer fun like gondola rides and golf course. A challenging golf course beautifully placed in the foothills of the Wasatch Mountains, provides a banquet room and dining services. With green fees of $43 for 18 holes, Park City Golf Course is the only public course in Park City itself. Located just 20 minutes to the south, Heber has a number of public courses. While most are private, some of the newer courses have an occasional promotion to permit non-members to play. Park City has developed into a prime area for golfing, with some of the best courses in Utah located within an easy drive from town. While most of the Park City golf courses are private, there are plenty of public options around Heber and in Parley's Canyon. As a piece of local advice, some of the private courses (particularly the new developments) will run specials that allow the general public to play the course. These are usually restricted to weekdays or off-times, and are only available sporadically. However, they can be a great opportunity to play one of the great private courses in the area. Course Description - Given the sheer number of private courses, Park City provides an excellent option as a municipal course, offering an affordable round on a classic design. For those trailing in a competition, the gambling man's par 5 finishes the course with a chance to make up some strokes. Location - The pro shop is located in the Hotel Park City on Thaynes Canyon Drive, on the north side of Park City. Green Fees - A full 18 holes costs $50, and $35 for residents. Carts are an additional $15. Off-season prices are $30 for non-residents and $26 for residents and afternoon play. Season - The course is closed during winter. Contact Information - Call 435-615-5800 to reach the clubhouse for reservations or other questions. Course Description - Coming in at a difficult 7,541 yards with a 75.7 rating, this was named the best course in Utah in 2005-2006 by Golf Digest. Tom Fazio's par-71 design melds the course with the landscape in a natural setting that emphasizes the beauty of the surrounding mountains. Location - From Kimball Junction Exit 145 of I-80, head east on the northern frontage road (Rasmussen Rd.) until reaching Glenwild Dr., which winds up the hill to the gated community. Green Fees - The private course is only open to members and guests of members. Contact Information - The clubhouse can be reached at 435-615-9966 for questions about membership and any other inquiries. Course Description - Since 1983, this Jack Nicklaus course has hosted ten Senior PGA events, which means golfers get to walk the same fairways as some of the greatest players of the game. The $7.5 million renovation of the course in 2008 brought the course up to the highest standards. Location - From downtown Park City, head north on Park Ave, taking a right onto Kearns Blvd. Take the second left onto Monitor Dr., followed by a right on Lucky John Dr., which leads directly to the course at 2000 Meadows Dr.
Green Fees - The course is only open to members and their invited guests. Contact Information - Call 435-649-2460 for information about membership or any other questions. Course Description - The Jack Nicklaus Painted Valley Course is an 8,136 yard monster rated as the toughest course in Utah. The Pete Dye Canyon Course is the only course in Utah designed by this World Golf Hall of Famer. 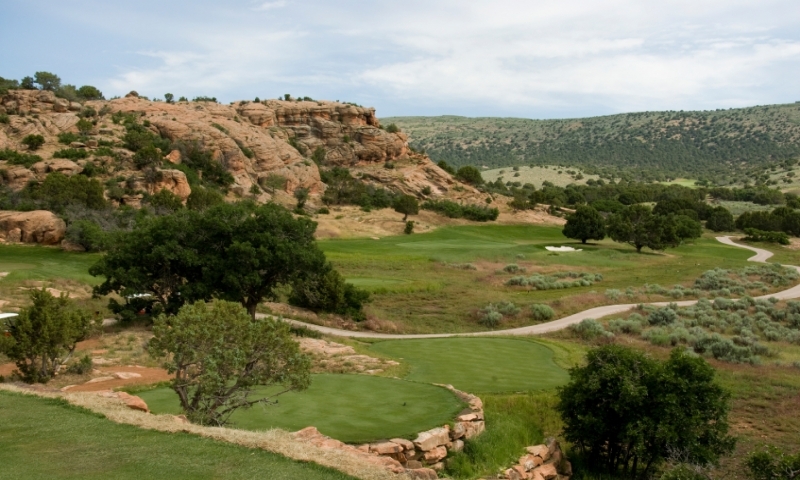 Fortunate for members, these two courses are located in one private club outside Park City. Location - The two golf courses are located off I-80 exit 150, taking Promontory Ranch Rd. east to the clubhouse. Green Fees - Both the courses are open to members only. Contact Information - The phone number for information about golf memberships is 888-458-6600. Course Description - Opened in the fall of 1981, this Arnold Palmer / Ed Seay course has proved that a great design is timeless. The 73.6 rating indicates the challenge still inherit in the 7,152-yard course. Location - The Jeremy Golf Course is located on 8770 North Jeremy Rd. From the I-80 Jeremy Ranch Exit 141, head north on Homestead Road to Rasmussen Road. Turn left and Jeremy Road will be the first right-hand turn. Green Fees - The course is reserved for members and guests only. Contact Information - For information regarding memberships, please call 435-649-2700. Course Description - As Masters and British Open champion, Mark O'Meara knows something about course design, and channeled that experience at the Tuhaye Course at Talisker Deer Valley. The 7,801 yards play long and tough, so keeping it in the fairway is as important as ever. Location - From I-80, take exit 140 to US-40 South. Turn left onto State Highway 248 towards Kamas. (From Park City, take Kearns Blvd. north, which becomes UT-248.) The entrance is after the Jordanelle lookout, about eight miles down the road. Green Fees - The 2006 course is only open to members and guests. Contact Information - Call 435-333-3636 for information about the course or membership inquiries. Course Description - This 7,599-yard links course, designed by Reese Jones, opened in August 2009 with huge views of Uinta Mountains. The layout rises to nearly 7,000 feet in elevation, where the balls will simply soar. Where they soar, however, is the better question. Location - This new development is located 2.5 miles west of Francis. To get there from I-80 or Park City, head south on US-40 until reaching UT-32/River Road. Turn left onto River Road, then turn right before the large red barn at the Victory Ranch Gate House. Green Fees - The course is open to members only and their invited guests. Contact Information - The clubhouse can be reached at 435-785-5020 for questions about membership and any other inquiries. Course Description - Located in the Wasatch Mountain State Park, Soldier Hollow is a 36-hole golfing complex that was part of the 2002 Olympics project. The 7,355-yard Silver Course is the easier of the two, with the long 7,598-yard Gold Course winding through the foothills above Heber Valley. Location - From I-80 Exit 146, head 14 miles south on US-40 until reaching River Road. Turn right and drive 4 miles to Main St. Turn right, then a quick left onto S Center St., which leads south. Turn right on Tate Ln. and left onto Stringtown Rd., which will lead to the clubhouse. Green Fees - 18 holes will lighten your wallet just $45-$50. Season - The course is open from May until September, with shoulder seasons depending on the weather. The course normally opens in April and closes in October. Contact Information - Call 435-654-7442 to schedule a tee time at either of the courses. Course Description - Regularly highlighted as one of the best public courses for the combination of well-maintained courses, the approachability of the course, and the summer temperatures that are 10-15 degrees cooler than in the valley. There are two courses to play: the Lake Course features 6,942 yards of subtle, rolling landscape; the Mountain Course is a shorter 6,459 yards, but the hillside lies and uphill drives add a unique element to the course. Location - From I-80 Exit 146, head 14 miles south on US-40 until reaching River Road. Turn right and drive 2.5 miles to a roundabout, taking a right onto Burgi Lane. Take a right onto Pine Canyon Rd, then continue for a short while until the golf course appears on the left. Green Fees - 18 holes cost just $50 on a weekend and $47 on weekday. Contact Information - The phone number to schedule a tee time is 435-654-0532. Course Description - Shooting a manageable 7,040 yard, par 72, this Bruce Summerhays course has full amenities, including putting green, chipping green, driving range and plenty of food and beverage options. Location - From I-80 Exit 146, head 14 miles south on US-40 until reaching River Road. Turn right and drive 2.5 miles to a roundabout, taking a right onto Burgi Lane. The Homestead Entrance is well marked, 2.1 miles away. Green Fees - Fees are $45-$59. Season - Weather permitting, the course is open from April 1st to October 31st. Contact Information - For tee time reservations or general questions, call 888-327-7220. Course Description - Although it's part of the Salt Lake City municipal system, the two Mountain Dell courses are located near other Park City, Utah golf courses. The Lake Course comes in at 6,745 yards, with rolling fairways over challenging hazards. The 6,787-yard Canyon Course uses the natural terrain as the prominent feature. Location - From Park City, take highway 224 to I-80 and head west. Drive 10 miles to exit 134 and take two quick rights onto the frontage road, which leads directly to the clubhouse. Green Fees - 18 holes will take just $35 from your wallet. Season - Due to the lower elevation, Salt Lake's golf course stay open as weather permits. Often running into November and starting as early as February, winter reservations can only be made one day in advance. Contact Information - Reservations are made online or by calling 801-582-3812. Course Description - Rated as the Best New Private Course in America by Golf Digest in 2009, the 7,653 yard course is a Jack Nicklaus Signature Course that winds through the Wasatch Mountains east of Heber. There is also a short course available, consisting of par 3s and par 4s. Location - From I-80, take exit 140 to US-40 South. From Park City, take Kearns Blvd. to US-40 South. Drive 13 miles, turning left onto Center Street in Heber. The entrance will be on the right at 1851 E. Center St.
Green Fees - The course is open to members only. Contact Information - Contact 435-657-4054 for information about membership and other questions about the course. The Utah Golf Association strives to promote the sport of golf within the state as well as to support the interests of local golfers.